With a bit of common sense, you should know that you can’t just give your Guinea Pig any kind of food. This is where this Guinea Pig diet sheet guide comes in. In general, we are talking about the likes of salad foods, hay, specialized nuggets or pellets and muesli mixes and so on. We are not talking processed foods we might eat. Now lets look at the foods. Guinea pigs cannot store Vitamin C in their bodies so they need to get it from foods. The following list of Guinea pig foods will help you decide on what to give them. As you look below you can see that fruits in general are not the healthiest although they do love a lot of them so only feed these sparingly. The general mix should be mainly salad items, along with fresh hay and unlimited water each day. Stick to just once or twice per week with veggies as it can lead to bloating and upset stomachs for them. In general make sure they have water and hay available all day long. Looking for a suitable Guinea pig outdoor hutch? We have that covered with our top 10 best – reviewed. Getting a good selection of Guinea Pig toys is essential to ensure a happy piggie. Getting a Guinea pig as a pet can be fun to watch and to hold however keeping them happy is very important. They are very social animals and can become quite lonely when alone so in our experience it is highly recommended to have a minimum of two together. It’s a herd mentality and they love nothing more than being part of a community. While you or I go out several times a week and visit many different places, a Guinea pig has only the same space, day in day out so you do need to give your pig(s) something to do. They can’t just pop the TV on. You could opt to make homemade guinea pig toys or choose one of the many inexpensive toys already available online like Amazon. How about simple Guinea pig toys made from household items? Homemade Guinea pig tunnels or places to hide. These can be as simple as an old cardboard roll from leftover carpet tubes (the cardboard that comes inside a roll of new carpet). Or you could simply get some stiff cardboard and sellotape it together. How about a hat or cozy? Fancy swinging around in this pet hammock swing?? What to Guinea Pigs like to do? Well, Guinea pigs enjoy a variety of things. Many things – a lot of the time, so be sure to put something in with them to help keep them active and busy. They need a good amount of space to be able to hop around. If you house tow or more you need to double or triple the amount of space they have. We already have this covered. Please look at our top 10 best guinea pig hutches available online here. Taking them back to their basic animal instincts, foraging for food is something that every Guinea pig was born to do. Why not make life interesting by hiding their treats inside a toy, or under some paper or straw. This helps keep them active and interested. Because a Guinea pig is very small, out in the wild they are very much at the risk of birds of prey or other animals who feed on rodents and the like. This in-built instinct within a Guinea pig means they should always havea special place they can go and hide. A tube or under a rock works wonders. Yep, like many animals, a toy helps relieve boredom and I’m sure it makes them a little happier as a result. So what will you do to keep your piggies happy? What toys have you found to be of great fun? let us know by leaving a comment below. .. but….. did we spend a night in one of them? So… first of all, remember that Rabbits and Guinea pigs are very sociable animals. It’s best if they can be paired up wherever possible to keep them happy. If you’re super busy, we wanted to let you know our number 1 (and 2) preferred rabbit hutch or guinea pig hutch that shone out was not one, but two hutches. The Ferplast Grand Lodge and the Conny hutch. Most Guinea pigs get along with a fellow furry friend, so it’s usually a good idea to house two of them together. Therefore look for the best guinea pig cage for two of them. An outdoor guinea pig cage will always suit your furry Rabbits too, so try to imagine them having a bit of room to run around, and you’ll have far happier pets. We had a lot to think about. You would have assumed that hutches are pretty much the same. Do we want indoor cages or outdoor cages? Would it fit our space? Is it easy to clean / is there a slide out tray ? So we eventually filtered out everything that didn’t meet these expectations and here is our top 10 list. After weeding out the poor hutches, the not so well made hutches and the strange ones, we narrowed down these 10 best hutches. They are all “really” good however two of them edged out for us and we couldn’t choose between them. The above outdoor guinea pig cages are our current favourites. Very well made, great pricing and great construction. Remember that outdoor guinea pig hutches need to be safe, strong and warm. Your piggies and rabbits need to be protected from a variety of things, such as them venturing out into a neighbours property, into the road, or beging taken by a predator such as a large bird or fox for example. Take any of the above outdoor guinea pig hutch designs and they won’t let you down. This is why they get our current highest recommendations! Here is a breakdown of the top 10 best rabbit hutches and guinea pig hutches. 8: Trixie Natura Premium Hutch We LOVE this. Plenty of room and even storage space in the roof. A stunning outdoor rabbit hutch! This is one brilliant deluxe rabbit hutch you are going to immediately fall in love with. It’s completely modern and stylish and ever so easy to clean – thanks to the pull out galvanized tray. Pull out, tap and wipe clean and all done! It’s a metre and a half wide, a metre high and 66cm deep. Think that the main enclosed bit is for them to sleep in or rest and the rest is for play and exploration. This is equally as good in use as an outdoor rabbit hutch or for indoor use. Plastic and wood construction throughout. Not “huge” so isn’t ideal for two grown rabbits, although there are separate extension kits you can get. Overall this has found it’s way into our top 10 list for a reason. It is an excellent hutch. There are literally hundreds that haven’t made it to this stage. 2: Outdoor small hide house + 1 x Large VivaPet Outdoor Octagon 55-inch Run / Cage / Playpen / Enclosure for Rabbit Puppy Chicken Duck Hen Guinea Pig, with Sun Protection Net Cover review. Although not technically a “hutch” per-se.. we absolutely love what is on offer. A complete fair weather setup that will perform just as good for most of the year too. It’s a mini hideaway with an integrated playpen area with safety net cover too making to great to be left out all year other than deep winter when you may want something a bit more heavy duty, or even take your piggies or rabbits indoors. The hideaway is around 50cm wide, 43 cm deep and 46.2cm high. The net is part see through to provide space to hide from the sun, and to help your pet from jumping out or even birds or cats taking “too much of an interest”! The roof opens to allow easy access for cleaning etc. Would be brilliant if the hideaway was bigger or more of a hutch, but we are just being picky! Deeper and higher than other cages, this 6 foot “luxury” Rabbit hutch provides superb living accommodation for your furry friends! It is premium in price and generally premium in quality too, however there are a few misgivings to consider firstly! Double rabbit hutch – super deep! We love the brilliant space that you get. Your guinea pigs or rabbits will really enjoy this. The floor sections and back panel appear to be made of a thinner wood, so if this is to be used in Winter you might want to consider a quality waterproof hutch cover. Your typical up and downstairs type of hutch. Great as a fun rabbit house or guinea pig getaway, or for ferrets etc. We feel the confidence pet 4 foot deluxe outdoor hutch is a lovely size for either 2 guinea pigs or 2 smaller rabbits. The manufacturer claims up to 5 or 6 rabbits but I’m not so sure if that is wise. A pair normally works best and this allows for room to play also. With plenty of access points, viewing areas and room, it’s an interesting space for your furry friends to play around in. The hutch is made from quality wood with an antifungal finish to it. This hutch is very well made and tough too. It really is superb quality and can withstand a solid downpour even without a raincover. If you want a raincover here is one that is a perfect fit. The heart shaped latches seem a little flimsy, easy to remedy with some blocks of wood if this gives you any concerns. One of the best outside rabbit hutches for smaller Rabbits (or Guinea Pigs). A more compact hutch, perfect for 1 or 2 smaller rabbits or guinea pigs that even comes with a slide out tray for easy cleaning! Better suited to smaller areas. This hutch measures 91cm wide x 45 cm deep x 92cm high (and that includes the overhang at the top so remember just for smaller animals and you’ll be fine). As you can see the top opens on a locking hinge making clean outs super easy, especially with the added advantage of the pull out tray (whoever invented this needs a pat on the back!). Access for cleaning is a doddle! Made from wood from sustainable forests, this is a lovely cute hutch if you care about the environment. A fairly typical standard size (roughly 100cm wide, 100cm high and 50cm deep) it’s a cute design with pitched roof that opens out from the centre. So, while researching and testing this hutch we noted that the English language was not native in the product description on Amazon, however from the tone displayed in the writing it was easy to see the good vibes and positivity around this hutch, and taking that into consideration. Made from sustainable forestry efforts – great for environmentally aware people. The ramp is fairly steep, so if your piggies struggle, try laying some sandpaper down on the ramp and use glue to hold it in place. This is one of our favourite hutches. Clean lines, contemporary clean feel, and with it being tough plastic, it’s not going to rot down from bad weather or pet wee! It’s different, and that uniqueness is captured so well in the solid plastic design that is clean, tough and welcoming. Feeder, Feeding bowl, drinking bottle, 2 x wooden ladders. Performs well if you want to add on a rabbit run to allow for movement through the day. A perfect guinea pig hutch and run! This is just way too cute. It’s one of the best hutches for rabbits due to the grand size of it. It pretty much summarizes what a hutch should be. A nice quiet space off the ground and plenty of room down below for fun and games. Storage in the roof too! Made from solid glazed pine. space in the roof for storage of pet essentials – bedding, food etc. The bolts to close the door appear a tad on the small size. Adequate for 99% of situations however if you live where there are foxes you might want to purchase one or two extra bolts from your local DIY shop for extra strength. Although very much a premium top quality product, we would liked to have seen this a touch cheaper. To complement this hutch, here is the correct winter rain cover that allows access to doors. It fits around the hutch brilliantly, fitting snugly under the roof. Made from eco-sustainable forests, the 140 x 65 x 120 cm Apex hutch has neat modern features that will provide great living conditions for your furry friends. Ideal for one rabbit or two or more guinea pigs. We liked the fact that the construction is extremely good. The roof is covered with a weatherproof Bitumen felt to keep the weather out. So… let’s start out by stating that this isn’t a hutch, so to speak, but it made it into our top 10 list. We feel this Charles Bentley a-framed hutch would suffice for pretty much all year round. You can of course bring your rabbits or guinea pigs indoors in Winter if you prefer. Note… this is best suited to a single small rabbit or 2 small guinea pigs at best. So, for a start, with it being an “on the ground” hutch, over time the wood would eventually become susceptible to the damp. As a spring, summer and autumn hutch it’s good, however if you are considering using this during winter you might want to incorporate a bit of DIY to extend it’s lifespan. Our view would be to attach a piece of ply board to the bottom and then raise the entire thing off the ground with bricks during wet or wintry weather. It helps air flow underneath, stopping dampness from getting to the wood. Bear in mind if purchasing this, that the walls are made from thin wood, so extra bedding or heat pads would help during winter. Better still pop it indoors in a spare room! There are dozens and dozens of things you could use from home to make toys for your Guinea Pigs. The video below will help get you started, and there are lots of related videos on there that will give you a head start too! As a brief summary, think about things they can nibble on or chew. Cardboard toilet rolls are great (it helps them nibble to keep their teeth down and stop them growing too much. Soft cuddly toys – yes piggies love them, just keep an eye closely in case they decide to eat some of the inner fluff. Rabbits have similar obsessions as Guinea Pigs and enjoy simialr toys, but can also get into slightly tougher items such as Wicker baskets, paper bags etc. All good for their interest and helping to keep their teeth nice. Here’s a video showing a few home made rabbit toy ideas (again there are plenty more videos after this one if you get engrossed in them). We produced an EXTENSIVE writeup on the top 10 best dog beds you might find useful here. First of all, why did I decide to write a review on the best dog beds? Well, since the addition of a new puppy into our life, it quickly became obvious. Before we carry on, we wanted to let you know our preferred dog bed. The one that shone out best for us was the Fur Paws Faux Pet sofa. Say hello to our own dog! Say hello to our Betsy! She loves to jump up on to our settee (even now as I write this she is snuggled into my partner). Ideally though, we want to get her to “want” to be on her bed. A place she would rather be – letting us reclaim our furniture as our own. We had purchased a standard £5 dog bed – small and square and quite comfy, as well as an oversized large pillow she can dive onto. The trouble is, she loves our sofa more! Dog Beds – why bother? Your dog will really appreciate a place to go to that they know is their own. Once this is established, you can ensure that your dog stays off your sofa and stays on their own bed. Fancy dog beds – for the ultimate pooch pampering, a luxury dog deserves a luxury bed. Elevated dog beds – good for dogs with joint pains, and to help keep them up off cold floors. and of course dog beds for small dogs or big dogs.. make sure to get the right size. After all our testing our conclusion is that the Fur Paws Faux Pet sofa is by far our favourite. You are the master – a dog needs to know their place. Even though they are adorable and loving, if they get away with everything they will never do what you want them to do when the time matters so setting a good basis is key to a good relationship. Keep off your bed / disturbing your sleep – your dog will of course take up some room in your bed and this will leave less room for you to ensure a good nights sleep. Your dog (as great as he or she is) needs their own place for sleeping and resting, or even to just get away from noise every now and then. Owning a pet can cost owners £3500 in the first year. Eeek! This Dail Mail article explains why. One of the snuggliest beds we've ever seen with super high sides! 2: PetFusion Ultimate Dog Bed & Lounge review. (Large Gray, 92x71x23CM). Premium Edition Solid 10.5CM Memory Foam Memory foam! Incredible comfort for your dog. Our 2nd Choice! Super easy to clean. High sides, comfy. Great value! 6: Hobbydog Dog or Cat Kennel / House / Bed review – S – XL Paw Design Easy to clean. Zippered roof panels. Our Choice! Well made, holds it's shape, just like a sofa! 10: Chester and Wells Hampton Dog Bed review, Large, Black or Beige Premium executive product. High end top of the range. What’s wrong with the £5 or £10 beds? Truthfully not a LOT wrong with them, but you do begin to see issues once you get into the cheapest dog beds category and we wanted to ensure we follow our rule of only showing the best things at the right prices that represents value for money. Warning: For under £3 it’s a dog bed that is cute but looking at the reviews at the same time several people have complained they never received theirs (although in fairness others did get theirs) so this dog bed is not featured on this page but it deserves a mention for the price and you decide if you are willing to take a chance. Flimsy and thin – most dogs will test their beds to destruction so you do really need something that will last a lot longer than a few nights. Sizes not as described – sometimes, overseas sellers get their sizes wrong when manufacturing them or sending them to you. Sadly this means your medium dog bed may only be big enough for a hamster. The cute beds always get to us! – Sometimes you see the cutest beds around. Take this one that looks like a strawberry – a very popular dog bed but sadly its lucky if it’s big enough for 2 guinea pigs! So, what are the best dog beds around? This is really a personal thing, but something to bear in mind that you may not have considered are the memory foam dog beds. This may seem a bit “over the top”, but when you consider previous reviews you quickly see how good they are. Dogs WANT to use them and prefer to use them. Everyone whose ever owned one before says how GOOD they are. Not only that but they are especially good for dogs who have muscle and joint issues – the relief from these pains is instant. So take a closer look below and decide for yourself. Measuring 80cm x 80cm x 30cm high this is one extra snuggly bed for your dog. The Alidho has all the dog requirements and hallmarks of a top notch dog bed. The inner pad features a Union Jack on one side, or it can be flipped over for a simple matching colour. This size (L) will suit medium sized dogs. If you want a bigger dog bed (such as for Labradors etc.) then choose the XXL size (not available currently but you can review other Knuffelwuff xxl beds here). This will allow them to curl up and stretch out in pure luxury. Despite the seemingly hefty price tag, we were amazed by this dog bed. The bed features memory foam, which as you may know cradles your whole body for the ultimate sleep. During our research we found that virtually every single person had an incredible experience with this bed. This Petfusion branded memory foam dog is for those who are tired of cheap pet beds that easily tear, are difficult to clean, and don’t provide your pet the comfort they deserve. Featuring a solid 10.5cm memory foam base that helps with joint pain issues and provides superior comfort. Features a water resistant and tear resistant cover for added peace of mind. Pure unadulterated luxury that your dog will thank you for. This Wolfybeds doughnut shaped fleece bed will simply make your dog want to snuggle up and hibernate for the next few weeks. Super comfy and your dog will love it. Be wary of the possibility of colour transference from the bed to lighter coloured furnishings. Be wary of the possibility of colour transference when in a washing machine – ONLY wash on a cool 30 degree heat and not with any other fabrics. For dogs suffering from joint issues such as arthritis or hip issues, this elevated dog bed offers comfort and relief. Suitable for dogs up to 60 kg in weight, the snoozezy dog bed helps support the joints while taking the pressure off them. It will help keep the dog warmer in Winter and cooler in summer. It’s also easy to clean – simply give it a good hose down. Easy to assemble & disassemble, no tools required! The large sized bed has been on a sale price the same price as the medium sized bed since 2014! Elevated dog bed helps air circulate, ease joints and keep your dog cool in summer and warm in winter. Measuring 76cm x 64cm x 24cm, there is plenty to be grateful for when your owner buys you this super snuggly, odour free heavy duty waterproof softee dog bed. For dogs who love to get wet and dirty on a regular basis – this is the bed to handle their mischief! The cover on this dog bed is a heavy duty hard wearing 100% polyester waterproof material treated with a water-repellent coating. Dirt and debris was easy to brush off, while we could use a wet cloth or tap to clear the bed. Designed to keep your pet warm & comfortable. The thick base cushion (removable for easy separate cleaning) and the high walls of this bed are filled with bonded Thermal Polyester Fibre to insulate your pet from the cold floor and keep it out of draughts. 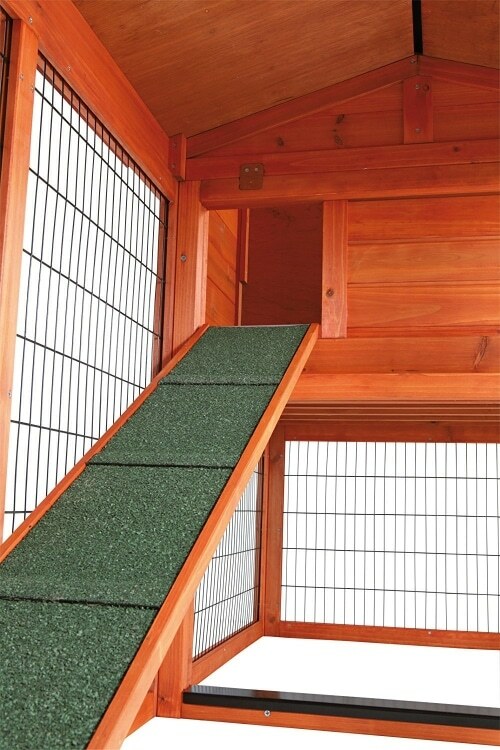 Offering 4 different size options, we like this pet house – a lot! It features two zips for the roof (as opposed to Velcro) which should help it last for many years. The 3rd sized house out of the 4 available ones (size 3) is a good size for many dogs such as staffies etc, however as with most beds its advised to go one larger. In fact unless you have a very small dog we recommend the XL one. Some large dogs might find it a struggle (such as Labradors) so for that reason you should consider the inner dimensions and whether your pet can comfortably get in and out, move around etc. Washable with a simple wipe from a damp cloth, waterproof and very well made. Good looking pet house that will push your “cute” buttons every day making you smile! Handmade, artificial leather. The ultimate decadent indulgence for your pooch. For the times when your pet simply wants to be just like you and lay on the same as you. Measuring 90 x 70cm, the internal dimensions are approximately 60 x 45cm. This is the medium sized bed, however there is also a large sized bed to consider which is plenty adequate for Dalmations, German Shepherds etc. Hairs don’t stick in it – easy to keep clean! Looks just like a mini sofa! Your pet might not want to get off it! The perfect mini settee for your dog. The perfect dog bed, ever? After trialling this one with our dog, we were pleasantly surprised. The cover comes off and can be washed helping to keep it clean. The foam really does hold its shape extremely well, making it superb for all size dogs small to large! This is a nice dog bed with plenty of room. The only minor fault we can consider is that upon opening we discovered the manufacture stats that you cannot wash it with water – only a stiff brush. We assume quite rightly this means no washing machine, however I’m pretty sure a damp cloth would work just fine. Made with Oxford cloth which will not harbour dog hairs. Finished to the highest standards in Faux leather, this Chester and Wells Hampton dog bed exudes luxury like no other. Forget other substitutes. Forget lookalikes. Forget dog beds that are like furniture. this IS furniture, and your dog will appreciate the feel – that is if price is of no issue of course. So, the build quality is second to none. The largest size measures 70 x 112 x 45 cm (plenty for pretty much most dogs). The smallest size measures 52 x 67 x 40 cm (just about right for your small dog) and is substantially cheaper. Considerably more expensive – at least 5 to 10 times more expensive than most average dog bed prices. Do You Have a Rabbit Or Guinea Pig? If so, you might find this article of interest showing the best hutches around that suit Rabbits or Guinea Pigs. I hope you’ve enjoyed looking at the best dog beds. Now what else is there of interest? How about learning about the right bed for a large dog like a St Bernard? We have the facts here.